This is the first game in the Duke Nukem series. For other games in the series see the Duke Nukem category. 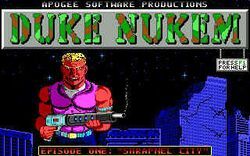 Duke Nukem is a 2D platform game that was released by Apogee Software on July 1, 1991 in North America. It was released in Europe in 1992. The game is set in the year 1997 (which was the "near future" at the time of game release). Dr. Proton is a madman, determined to take over the world with his army of Techbots. Duke Nukem, the eponymous hero, takes upon the task of stopping him. The first episode takes place in the devastated city of Los Angeles. In the second episode, Duke chases Dr. Proton to his secret moonbase. In the third episode, Dr. Proton escapes into the future, and Duke pursues him through time, to put a permanent end to his mad schemes. This page was last edited on 29 May 2016, at 18:31.